Where can I buy things with the CSfC Logo? The candidate forum, co-sponsored by Medford for Massachusetts and Progressive Democrats of Somerville, was a great success. The forum was well-attended and the space at Tufts was perfect. Carl Sciortino was a great moderator, and we were happy to have Christine Barber and Sharon Guzik participate in the hour-long question and answer session. The district includes wards 4 and 7 in Somerville, and wards 4 and 5, and, in Medford, precinct 1 of ward 7 and precinct 2 of ward 8. The primary will be on Tuesday, September 9. 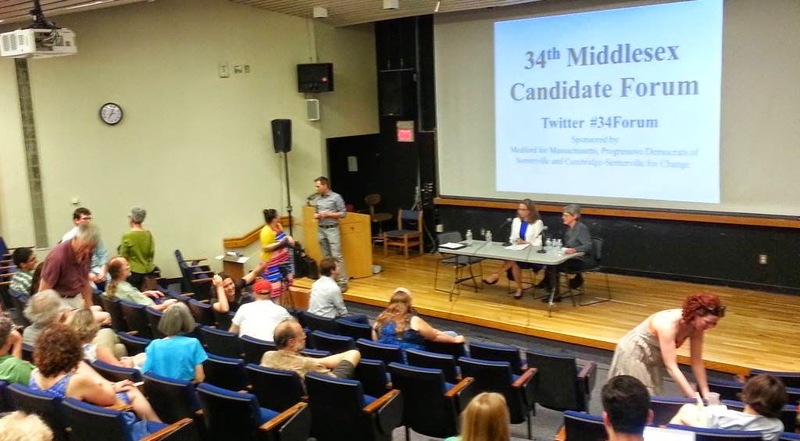 0 Responses to "34th Middlesex State Representative Candidate Forum on June 29 Update - Videos and Questionnaires"
Cambridge-Somerville for Change is an all-volunteer community group dedicated to harnessing the grassroots energy and spirit of change inspired by the Obama campaign. Our organizing work includes electoral and issue-based campaigns at the local, state, and national level. Our members have chosen to work on promoting economic fairness, comprehensive health care reform, creating policies that conserve energy and reduce greenhouse gas emissions, provide for fair and adequate access to public transportation, and promoting in-state tuition for immigrant youth. Join one or more of our local action teams. Or join our email list by sending an email to info@cambridgesomervilleforchange.com. Note: Contributions are not tax-deductible.